The Weeks Fish Camp, which was located just off Coconut Road on the west side of U.S. 41 has been a family owned and operated fishing village for some 70 years. In April 2018 it was sold to a developer for $12.75 million. London Bay Home has plans to develop a 300-unit continuing care retirement community at the site which will house both independent and assisted living residents. London Bay Homes has decided to allocate three acres of land in perpetuity to allow boat access to Estero Bay, this was the focus of the marketing research investigation conducted by the Estero Council of Community Leaders (ECCL). In a recent online survey carried out by the ECCL, almost two thousand people expressed their views about the London Bay Homes development at the west end of Coconut Road (51% of those sent the survey link). Those who participated were from over 40 different neighborhoods and represented a broad cross section of the public. Two focus groups were also conducted with a total of 21 boaters who use trailers to launch their boats in the area. It was very clear from the responses that there is considerable concern about how the development would adversely impact the environment and specifically Estero Bay. The perceived increased traffic density on Coconut Road was a serious worry, not least for those living in The Colony. In addition, the planned boat ramp access and a kayak launch area was considered to be inadequate. While 73% were pleased that London Bay Homes was considering allowing access to Estero Bay, with the majority likely to use many of the amenities suggested, the three-acre site that has been proposed has many issues associated with its layout. The following chart indicates how people would anticipate using the various amenities that might be provided. During the focus groups it was clear that the proposed layout for the boat ramps was not considered satisfactory. 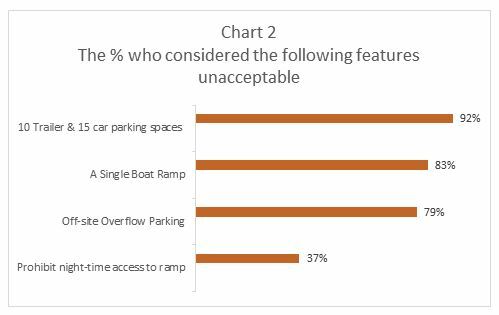 Although a minority seemed to think the idea of the boat ramp and it features were acceptable, the majority who were unhappy identified the following aspects as being unacceptable (see Chart 2 below). There should be at least two boat ramps (preferably three or four) and at least double the number of trailer and car parking spaces. This becomes even more critical as 60% believe the facilities would attract boaters from outside the immediate locale! 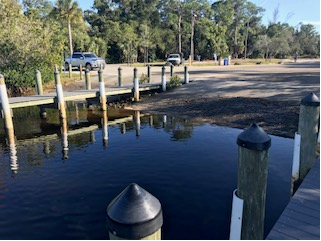 Here is a picture of the four boat ramps (2 double ramps 30 feet wide with central pier and tie-up spots at Imperial River Boat Ramp). The single ramp design was considered to be very poor and was not thought to have been prepared by someone familiar with launching boats. The launch sites at Punta Rassa, Lovers Key and the Imperial River were all identified as providing excellent access, ability to “stage” the boat before launch and provided several places to tie up after launch before parking the trailer in the center of the “circuit.” As there is no place to “stage” the boats at the proposed site, trailers will be backed up along Coconut Road which would likely lead to police intervention!! (See Punta Rassa site below with central parking area and room for trailers to stop and “stage” boats before launch. No reversing of trailers is required there, unlike the proposed plans). 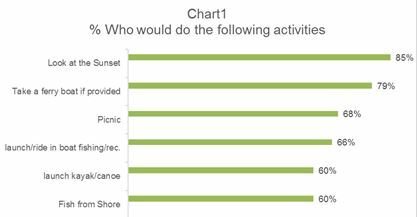 Night time access seems less of a concern to many, although 54% of boat owners did want night time access. There was general agreement that a three-acre site was not going to be a viable proposition. Many agreed (in the focus groups) that the launch site would need to be at least seven-acres to enable the proposals being put forward to be “workable”. There was little, if any, support for the idea of having a Ship’s Store, Fuel Supply, or Boat storage facilities. What was considered essential were bathrooms, facilities for cleaning fish (sinks and drainers), a vending machine, an Ice-maker and hoses with fresh water for cleaning boats. At least two, preferably four launch ramps are needed allowing “straight-line” water access. Site access must not cause traffic back-up on Coconut Road. Being time sensitive when launching is important to avoid delays which could lead to theft from the boat, or of the boat itself. There must be “staging” and tie up facilities. 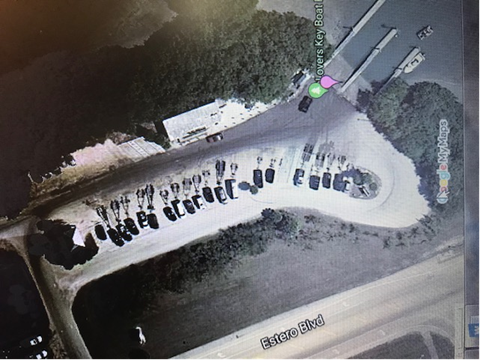 Sufficient on-site parking for trailers and cars is needed. Design must avoid the need to reverse trailers and thus requires central parking for trailers. Parking over half a mile away is a serious deficiency/ concern. Separate launch areas for boats and kayaks is important. Launching kayaks from a sandy beach is preferable to dockside or ramp access. The following comment sums up the overall feeling expressed by many. Although the willingness of London Bay Homes to provide Estero Bay access is considered encouraging, the marina design requires significant modification. The present design would cause boat trailers to become backed-up along Coconut Road, causing serious congestion, because there is no “staging” area. One launch ramp is insufficient and would result in significant delays and serious congestion. The likely impact on traffic on Coconut Road requires further study to determine needed improvements and who will fund them. Based on these conclusions, the recommendation is for Community Leaders to meet with London Bay Homes to assess their receptiveness to the suggested changes and establish whether an allocation of up to seven/ eight acres was feasible, to accommodate the water-oriented activities that clearly interest the community. The planed boat access would need to be redesigned in a similar way to those boat ramps mentioned earlier, such as Lovers Key, Punta Rassa and Imperial River Boat Ramp. Allan Bowditch has had a long career in Marketing Research Consultancy. For many years he was CEO and Chairman of the highly respected and successful Martin Hamblin Agency based in London, UK and Southport, Connecticut, which later became part of the German-based GFK Organization. He has been given Lifetime Achievement Awards for his contribution to Marketing Research. In more recent years he has been running his own Consultancy. Bob King is the Transportation Director for ECCL. In that capacity, he keeps apprised of proposed projects that could impact the roads in the Village of Estero. The London Bay Homes project caught his attention because the proposed 300 units Continuous Care Retirement Community (CCRC) would have an impact on Coconut Road.